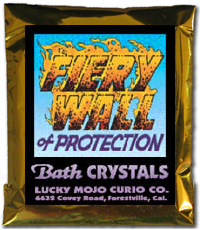 When taking a Fiery Wall of Protection bath, does one wash down or up? Are you bringing in the protection, or pushing away the problem? That's a good question, and my answer is that i would bath upward to cloth myself in protection. I live in an area that there is a lot of violence and several time right outside my window and door. I can't move right now I would like to know if I can wash my doors down or put something on my steps for protection from stray bullets and violence around me it's been a lot of shootings outside my door and ppl hanging out on my steps. Thank you for your response. Now do I take the Chinese wash and stand in my back door and pour the water out onto the steps and sweep it down? Than take the fiery wall of protection crystals and sweep the water back up the steps and do I need to say anything while I am doing this? You have to wash your house from back to front and then throw out the front door. Then, do what Deacon Millett said. In other words, your getting rid of the bad and then doing the opposite: bringing in protection (the good). I would to the East because you are calling and asking St Michael to protect you and asking the spirts of the work to protect you so calling in protection. If it was an uncrossing bath I would throw to the west to take away. Hope it helps. Does fiery wall of protection just protect you? Or does it cleanse you too? Fiery Wall of Protection Products are designed to keep you protected and help shield you from attacks. There are excellent products and methods for cleansing, such as the 13 Herb Bath. Please I just have a question . I can't remember where I saw about disposal before . Dispose the remnants using the traditional way. Or what happen if I just bath without disposal? For the optimal chances of spell success, it is essential that we follow the instructions given to us by Miss cat. That's all I can say about this.